The major benchmarks ended mostly flat for the week as drops on Thursday and Friday erased the gains from earlier in the week. The large-cap S&P 500 index managed to reach its highest level since last summer before retreating later in the week. The strong start to the week appeared to be due, at least in part, to reassuring comments from Federal Reserve Chair Janet Yellen on Monday that a rate hike was not imminent, however, a poll from the United Kingdom favoring a "Brexit" triggered a global selloff at the end of the week. The Dow Jones Industrial Average managed a slight gain for the week up 0.33% to 17865. The large-cap S&P 500 ended down -0.15%. Smaller Indices fared slightly better where the S&P 400 MidCap index gave up -0.12% and the small cap Russell 2000 was basically unchanged, down -0.02%. The tech-heavy Nasdaq Composite ended down -0.97% as did the Nasdaq 100 which fell -1.08%. Both Transports and Utilities were up for the week, with Utilities up 1.23% and Transports up 0.45%. In international markets, Canada's TSX ended down -1.33%, its first down week in five. Weakness was brought across the board in Europe as the United Kingdom's FTSE was down -1.5%, Germany's DAX index gave up -2.66%, and France's CAC 40 also ended down -2.6%. In Asia, China's Shanghai Stock Exchange declined -0.39%, while Hong Kong's Hang Seng index gained 0.46%. Japan's Nikkei ended down -0.25%. In commodities, precious metals rallied after being down 4 of the last 5 weeks with silver up over 5.4% to $17.33 an ounce, and gold rising $29.80 to $1276.30 an ounce, up 2.39%. The industrial metal copper gave up the last 2 weeks of gains losing over -4.4%. Oil started the week strong but reversed and ended slightly down to close at $48.88 a barrel for West Texas Intermediate, down -0.04%. In economic news, job openings matched the record high set in April, but hiring activity sank to the lowest since August according to the Labor Department in its Job Openings and Labor Turnover Summary (JOLTS) report. The number of job openings rose 118,000 to 5.788 million matching the peak set last July going back to 2001. That exceeded analyst forecasts for 5.7 million openings. Actual hires fell 198,000 to 5.092 million. Layoffs fell to their lowest level since September 2014. The number of Americans filing for unemployment benefits fell unexpectedly last week, suggesting to sustained growth in the labor market despite a sharp slowdown in hiring last month. Initial claims for state unemployment benefits declined 4000 to a seasonally adjusted 264,000 last week, according to the Labor Department. Economists had forecast initial claims to rise to 270,000. Claims have remained below 300,000 for 66 straight weeks, the longest since 1973. The smoothed 4-week moving average of claims fell 7500 to 269,500. Consumer-credit continues to expand at a healthy pace but cooled slightly in April from the surge in March, according to the latest government figures. Credit growth rose $13.4 billion in April, up a seasonally-adjusted rate of 4.5% according to the Federal Reserve. Economists had expected a gain of $18 billion in April. Consumer sentiment came in better than expected with a reading of 94.3, beating forecasts of 94.0. The University of Michigan's Index of Consumer Sentiment's survey is a monthly survey of 500 consumers that measures attitudes toward topics like personal finances, inflation, unemployment, government policies and interest rates. Richard Curtin, chief economist of the survey said "The strength in early June was in personal finances, and weaknesses were in expectations for continued growth in the national economy." Wholesale inventories rose 0.6% in April beating the 0.1% expected, according to the Commerce Department. Inventories recorded their largest increase in 10 months in April as stocks of machinery and farm products rose, suggesting inventories could be a boost to economic growth in the second quarter. Inventories are a key component of GDP changes. The wholesale component of inventories that goes into the calculation of GDP increased 0.8% in April. Last week saw the release of May's weak employment report, however a broader and more timely indicator of the state of the job market gleaned from federal income and employment tax withholdings is telling a more upbeat story. As suggested by the weak May employment report, the job market didn't start sputtering over the past few months. Actually, the labor market began losing steam last fall with a plunge coinciding with the market plunge at the beginning of the year. Since that time the labor market has been on much firmer footing. The latest data from June 3 rd, shows that over the previous month withheld taxes rose 4.7% from a year earlier, the fastest growth rate in seven months according to researchers at IBD. On Monday, Federal Reserve Chairwoman Janet Yellen highlighted "disappointing" jobs data while subtly eliminating the timeline of anticipated rate hikes by removing the phrase "in the coming months" from her speech. Stocks rallied to a 7-month intraweek high following the comments. Boston Fed President Eric Rosengren stated that the 4.7% jobless rate is his target for "full employment" and that he expects growth to remain sufficient to "justify a gradual removal" of monetary policy accommodation. Atlanta Fed President Dennis Lockhart said that he is against a June rate hike, but he still sees the economy on a moderate growth path and thinks two rate hikes before year's end will be appropriate. The CME's FedWatch Tool is now seeing only a 4% chance of a June rate hike and a 26% chance of a move in July. Before last week's job report, the odds were roughly 25-30% for June, and 60% by July. Turning to international markets, in Canada, the latest jobs report give an early glimpse at the economic devastation caused by the wildfires in Alberta. Statistics Canada reported that as a huge wildfire raged, job losses mounted, the unemployment rate surged, and total hours worked hit their lowest level in 30 years. The wildfires forced the production shutdown of Alberta's economically critical oilsands region and triggered the evacuation of Fort McMurray. Unemployment soared in Alberta from 7.2% to 7.8% last month following the loss of 24,100 jobs. In the United Kingdom, George Osborne, Chancellor of the Exchequer stated that if Britain left the EU, it would "lose control" of its economy. The Chancellor stated voters should be "scared" of the consequences of a Brexit. The Chancellor issued his warning on Wednesday, arguing that the economic turmoil predicted by economists was "not a price worth paying." In Germany, the German economic minister urged the G7 (Group of Seven leading industrial nations) to quickly allow Russia to rejoin the organization. Minister Sigmar Gabriel stated "Russia is an important global player and not a regional power." Gabriel, who leads Germany's Social Democratic Party said Russia remained an important economic partner for Germany and German industry. In China, the IMF says China's growing corporate debt could become a systemic risk. The level of debt is a major source of worry about the world's second-largest economy. David Lipton, first deputy managing director of the IMF warned that companies' indebtedness is a "key fault line in the Chinese economy." "Corporate debts problems today can become systemic debt problems tomorrow," Lipton said in a speech to economists in the southern city of Shenzhen. In Japan, the economy expanded at an annual rate of 1.9% in the first quarter, revised from a preliminary figure of 1.7%. The economy was helped by a fractional revision in private consumption and business investment that dropped less than first thought. The upward revision may be some relief to Prime Minister Shinzo Abe who is struggling to revive Japan's economy and decided to postpone an increase in the sales tax. 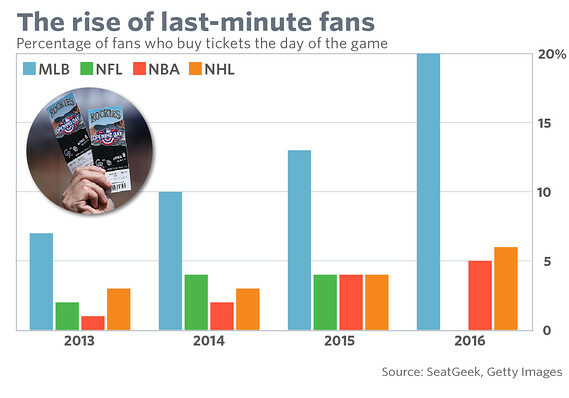 This week we look at in interesting new phenomenon in sports-more than ever, baseball fans are purchasing their tickets on game day rather than it being a planned event. So far this year, 20% of fans purchased their tickets on game day, quadruple the number from 2012-and it's growing. As tickets get cheaper and buying and selling on secondary markets becomes more convenient, ticket sales on game day have surged. Baseball is particularly suited for the practice due to the frequency of games and generally more hospitable weather.